The folks at 1SaleADay.com have done it again. And this one is a gem, like a ruby gem, like a ruby red laptop normally valued at $1,199 for only $399. 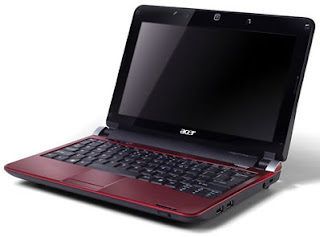 1SaleADay, for 24 hours only, is offering a true gem of a deal: Acer Aspire AS1410-8804 Notebook for $399. Here are some of the specs: Ruby Red color, 11.6" screen, 3GB Memory, 250GB Hard drive, 1.4GHz processor speed, HDMI hookups, up to 6 hour battery life. For me, the most important thing about a laptop is its battery life. A lot of PC laptops have short battery lives of up to only 4 hours, sometimes (a lot of times) less than that. And face it, the reason you get a laptop is so you're not teathered and can venture out further than the nearest wall socket. That is the reason I've been on the hunt lately for a good Macbook. But this Acer Aspire laptop is a different breed. It is built for portability. That is why it has a highly mobile 11.6" screen and amazing battery life of 6 hours that rivals the Macbook's battery life. That is amazing. Go ahead, mix business and pleasure! The Acer Aspire AS1410-8804 Notebook PC is thin, light, portable, and powerful enough for either business, pleasure, or both. This stylish ruby red color Notebook PC is unique not only because of its cool color. It has an Intel Core 2 Solo SU3500 processor, 3GB of DDR2 memory and a huge 250GB hard drive that can store all your movies and videos. Movies, videos, and photos are displayed in astonishing detail with its large HD Color LCD screen with 1366 x 768 resolution. It boasts a 6-cell Lithium-Ion battery that delivers hours of non-stop playing time and wireless Intel 802.3ab and 802.11n technologies to make sure you are in constant contact. Taking advantage of this opportunity is simple. Head over to 1SaleADay and buy it now before the clock stops ticking.